Many thanks for sending me the MRzine piece reproduced from Sader’s writing [Emir Sader, “Chávez, a Reader of Mészáros,” March 11, 2013, http://mrzine.org]. I have known Sader for a good number of years but I did not see his piece on the indicated blog. You can imagine what a great pain it is for me to think that Chávez is no longer with us. Shortly before he went to hospital for his big operation (and I had no idea how big it had to be) he made me promise that I would travel to Caracas later this year. I did indeed promise that I would go there in November, which I fully intended to do. He was—and remains—one of the greatest historical figures of our time, and what he has achieved, not only for the people in Latin America but for the whole of humanity, is certainly irreversible, no matter how much our enemies will try to undo everything, which they will constantly do, with the United States at the forefront of all such efforts. I had the great privilege of a close personal relationship with him for more than twenty years, going back to the time when he was arrested, six years before his election to the Presidency. 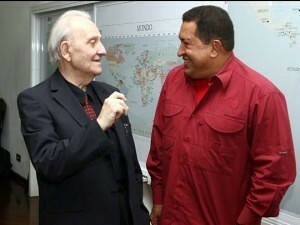 We had many hours of conversations together, on the occasion of all my travels to Venezuela. He was not only a deeply insightful revolutionary intellect—Sader is absolutely right about stressing that—but also a wonderfully warm personal friend. The pages you find about him in Beyond Capital [Monthly Review Press, 1995, 711–13] I wrote in 1993, when he was in jail, understanding already then what a tremendous contribution he could make to the solution of Latin America’s grave problems, and thereby also to our own pressing contradictions. I will certainly try to carry on doing all that I can in his spirit. I told him on the occasion of our last encounter that I was working on the problems of the state, and he was most encouraging, stressing the great theoretical and practical need for confronting the thorny issues that he had to face in the most tangible way in his daily work. My intention for our encounter in November was to tell him about the broad outline of what I was planning to write. Mészáros’s stress here on the “irreversibility” of Venezuela’s Bolivarian socialist revolution relates to a theoretical point, stressed in both Mészáros’s work and in Chávez’s actions and speeches. Chávez was very clear that the only way to build such irreversibility into the revolutionary process was to root the state organically in the people. It was Venezuela’s considerable successes at achieving that which has made it such a creative force in socialist transition. Already in 2002, at the time of the abortive coup against him, Chávez believed much of the necessary irreversibility had been created. He declared: “I’m certain that this process is irreversible. This movement of change, of restructuring, of revolution, will not be stopped” (quoted in Understanding the Venezuelan Revolution: Hugo Chávez Talks to Marta Harnecker, Monthly Review Press, 2005, 103). More than a decade followed in which the socialist revolution under Chávez moved forward, creating huge material, social, and cultural improvements for the Venezuelan population, and vastly increased the power of the people over their own lives through new socialist institutions (see Salim Lamrani, “50 Truths about Hugo Chávez and the Bolivarian Revolution,” March 9, 2013, http://venezuelanalysis.com). The most vital revolutionary achievement in these years was the introduction of the famous “communal councils”—the general idea for which, as Chávez himself stressed on numerous occasions, was taken from Mészáros’s Beyond Capital (758–70). For Chávez, who always knew that the time in which to effect these great changes was very short—given the counterrevolution that constantly sought to impose itself under U.S. leadership—the only defense, the whole basis of the revolution’s irreversibility, resided in the authenticity of the revolutionary process through the institutionalization of “popular sovereignty [which] constitutes itself as the protagonist of power” (Chávez, quoted in Mészáros, Beyond Capital, 712). The Venezuelan Revolution has been central during the entire period of its development to the conception of socialist transition presented in MR and Monthly Review Press books—and particularly since Chávez’s famous declaration in 2003 of the need for a “socialist revolution for the 21st century.” This is evident in two special July–August issues that we published: “Socialism for the 21st Century” (2005), and “Latin America and Twenty-First Century Socialism” (2010)—a book-length issue by Marta Harnecker. Monthly Review Press has published (along with Understanding the Venezuelan Revolution): Eva Golinger, Bush Versus Chávez (2008); Mészáros’s The Structural Crisis of Capital (2010)—a work in which Mészáros theoretically situated the Venezuelan Revolution and Chávez’s role in it; three landmark books on the transition to socialism by Michael Lebowitz, inspired by the Bolivarian Revolution: Build it Now! (2006), The Socialist Alternative (2010), and The Contradictions of “Real Socialism” (2012); and Steve Brouwer, Revolutionary Doctors: How Venezuela and Cuba are Changing the World’s Conception of Health Care (2011). In April 2009, at the Summit of the Americas meeting in Trinidad, Chávez arose from his seat, walked over to Barack Obama and handed him a copy of Eduardo Galeano’s classic work of the centuries-long exploitation of Latin America by the great imperialist nations (including, of course, the United States): Open Veins of Latin America. He inscribed the book, “For Obama, with affection.” As word of this spread around the world, the English edition of the book [published by Monthly Review Press] reached #2 on Amazon’s sales charts. In everything Chávez did he was a revolutionary, which he saw, like Che, as the expression of love for humanity. What stands out in all his actions and words was the absolute authenticity of this commitment. Nowhere was this more evident than in his conception (mentioned numerous times in the pages of this magazine) of “the elementary triangle of socialism,” consisting of: (1) social ownership, (2) social production organized by workers, and (3) satisfaction of communal needs. It was his attempt to create socialism as a social-metabolic form, unifying all of society, which represented his most important advance in the theory and practice of the transition to socialism (see Michael Lebowitz, “The Path to Human Development,” Monthly Review, February 2009). We are pleased to note the publication of a third edition of Paul Buhle’s Marxism in the United States: A History of the American Left (Verso, 2013). This is truly a new book, written in the aftermath of the Great Financial Crisis, the renewed interest in Marxism, and the Occupy and Wisconsin revolts. The expansive “Conclusion to the Third Edition” looks not only at the growing social instability and unrest of our era but also at developments in Marxist theory. The work of MR authors Robert W. McChesney, Fred Magdoff, and John Bellamy Foster receives detailed treatment in the context of addressing new Marxist understandings of: (1) the political economy of communications; (2) economic stagnation, financialization, and globalization; and (3) ecology and society. In the preface to this revised edition Buhle highlights the renewed centrality of class struggle—together with the increasing sophistication (in this respect) of a broad-based, popular movement that sees class as inextricably intertwined with all other struggles. 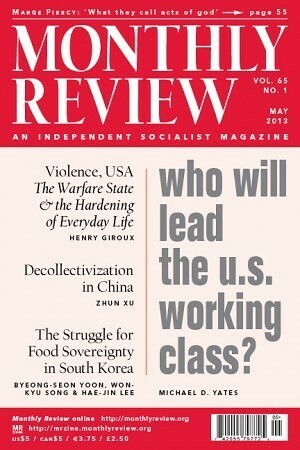 “The working class,” he writes, “has, at least in this [hegemonic] rhetoric, evidently ceased to exist! Yet the overwhelming class-versus-class character of the struggle against austerity, across wide parts of the world, has been clear, with every age, every race and gender represented” (xvii).